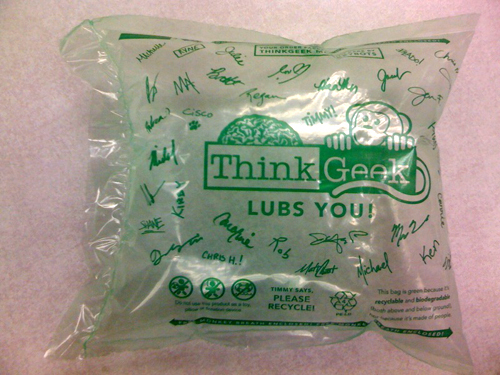 Someone in the office got an order from ThinkGeek and I just love the packaging cushions that came in the box! First it is recyclable and second it says funny things like "Come with free monkey breath inside". Think Geek rocks...I ordered something for my sons girlfriend last Christmas, thinking there was no way we would get it in time for Christmas..NOT ONLY did we get it in time for christmas...i ordered it at like 8pm...and it was delivered by 4 the next day...OMG!